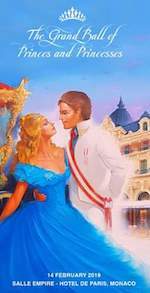 A fairytale ball of Princes and Princesses for Valentine's Day, including dinner, show and dancing. The event is an initiative of operatic soprano and UNICEF ambassador Delia Grace Noble. For more information and reservations phone +377 6 07 93 84 75, email grandbal[at]noblemontecarlo.mc and visit the event website at: Grand Ball: Princes and Princesses.